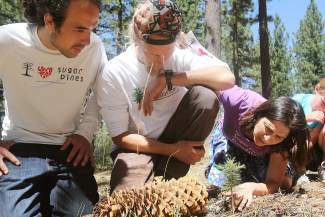 Sugar Pine Foundation employees Martin Rubio (left), Hugh Denno and Maria Mircheva check on a demonstration sugar pine seedling at the Lake Tahoe Demonstration Garden on Wednesday. The foundation has planted more than 80,000 sugar and white pine seedlings throughout the area in its 10 years. SOUTH LAKE TAHOE, Calif. — Sugar Pine Foundation Executive Director Maria Mircheva and two of her staff marched through the demonstration garden last week at Lake Tahoe Community College to check on some of the seedlings planted there in the past. First a few, then five, and then 11 were identified. Most were only six inches tall, mere fractions of the giants they could become. All appeared to be healthy. “Here’s a good example for a seedling,” said Mircheva, bending over a sugar pine sampling on a slope behind the college. The seedlings represent Sugar Pine Foundation’s efforts since it formed in 2005 to tackle the task of restoring sugar pines and other white pine species in the Lake Tahoe region, where they once accounted for 25 percent of the pine population. A decade later, the Sugar Pine Foundation has grown and flourished in its mission. It celebrates its 10th anniversary on Friday, Aug. 14. The foundation’s mission is simple: Replanting sugar pine trees to restore the region’s forests to a more historical balance and fostering a sense of environmental stewardship with volunteers. Mircheva, executive director since 2007, said the organization has accomplished a lot with its small staff and cadre of volunteers. More than 80,000 seedlings have been planted at nearly 30 sites in the Lake Tahoe Basin and the Tahoe Donner region. Mircheva said a majority of the sugar pine population fell to loggers’ axes during the Comstock era, with fire suppression efforts and vulnerability to the white pine blister rust, a European fungus fond of the tree, doing further damage. Some populations have survived at the higher elevations, like Zephyr Cove and Twin Peaks, where loggers couldn’t access them. “The first couple of years was about finding rust-resistant trees, and since 2010 we’ve been focused on planting,” Mircheva said. 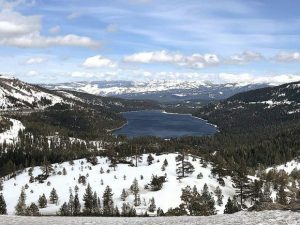 To date, the foundation has located about 70 white pine blister rust-resistant sugar pines in an area that includes Truckee, Tahoe and Sierraville. 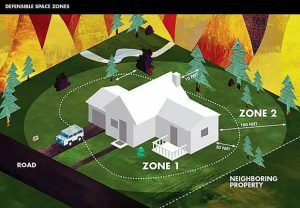 Some of the foundation’s pride-and-joy planting sites include Northstar’s residential area, Waddle Ranch at the North Shore and the restoration efforts around the Angora fire burn area. Most planting sites are small. It’s a viable project that’s taken root in restoration, said Hugh Denno, the organization’s plantings leader during the fall and spring. “You can think about it as us stepping up into higher elevation and next level of restoration strategy for the next 10 years,” said Denno, who first interned as a tree climber and filmmaker in 2009, producing the “The Seedling” for the foundation. The foundation has faced some challenges in its decade, including drought, funding and its efforts to work with the U.S. Forest Service and other land managers in the Lake Tahoe Basin. Both Denno and Mircheva said partnerships are strong but could be improved. And then there’s communicating the goal to the public at large. One hurdle getting people to care about the bigger picture of forest restoration. “There’s this view of people who think ‘So long as I have something to eat and live, why should I care about the bigger picture?’” Mircheva said. The foundation has used personal interactions to overcome a lot of its obstacles. Some of those interactions include volunteer efforts, selling sugar pines and leading plantings. “People like to see something and touch it and plant it in their yard in order to care for it,” Mircheva said. Those interactions have also opened up educational and volunteer opportunities over the years, according to Denno. Mircheva agrees, adding the foundation’s goal fosters forest stewardship and educational opportunities. The Sugar Pine Foundation has an eye on the next 10 years, including more planting and establishing stronger roots with agencies in the basin. Mircheva said restoration reflective of past tree populations is unrealistic, but ensuring the sugar pine’s continued existence in the basin is different. “We would like to continue the restoration project in order to strengthen key populations for the sugar pine so that they survive in the long term,” Mircheva said. Fire restoration efforts with the U.S. Forest Service remain another future goal. Disturbances like fires, she said, create more room for trees to grow without competition for resources from already established ecosystem. Another goal would be building a presence in metro areas like San Francisco and Sacramento to spread word and gain more momentum. But steady growth, said Denno, remains an overall project for the foundation. Sugar Pine Foundation will celebrate its 10th anniversary Friday at the Valhalla Boathouse, 1 Valhalla Road, in South Lake Tahoe. The celebration includes an art show from 1-4 p.m., presentations from 4-8 p.m. and live music featuring Weapon and Good Samaritans after 8 p.m. Tickets are $20 online and at the door.